I love Christmas! 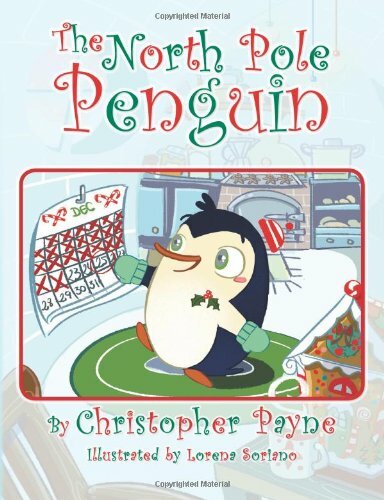 And so does the author of this new book, The North Pole Penguin. “I began thinking about writing a story when my niece was born because I thought it would be a great gift for her,” Christopher Payne told me in a letter. And now it’s become a shiny new book that’s ready just in time for Christmas…. Yes, this story even rhymes. (It’s like the book wants to be read out loud…) And every picture lets you follow its smiley penguin as he travels the world with a snowman. The snowman’s a gift for Santa Claus — so Preston probably should’ve avoided South America altogether. Ah, but he couldn’t, the author points out — because penguins live in the south pole! I really liked the message of the book. (I still get a warm feeling when I remember that Christmas is about the giving…) Even a prologue on the book’s first page reminds us that “Santa Claus is real, and if you believe in him and are brave enough to look for him, you might just get to meet him!” And I believe that’s actually true, if you read between the lines. Everyone knows that Santa is the spirit of giving itself — and in this story, it’s a little penguin who understands that best of all. The book traces the penguin’s long journey to deliver his gift to Santa, across the world — and even through New York City. I liked how the penguin shared a pizza with river rats “under urban stars”, and that all the animals he meets on his trip seem friendly and helpful. Maybe it’s a reminder that Christmas is celebrated internationally, or that generous people are everywhere. There’s even a campfire in Canada, and all the animals he meets contribute more gifts for Santa.